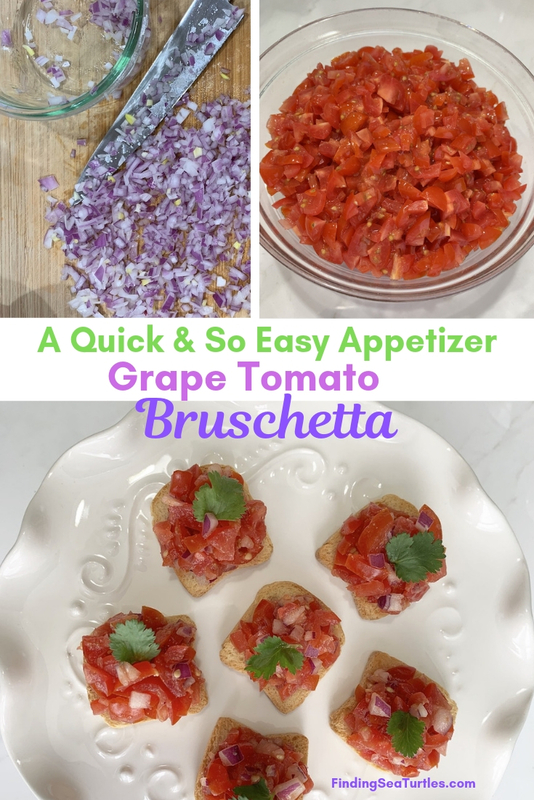 Grape Tomato Bruschetta – a quick and easy appetizer. Affordable appetizer to serve family and friends. 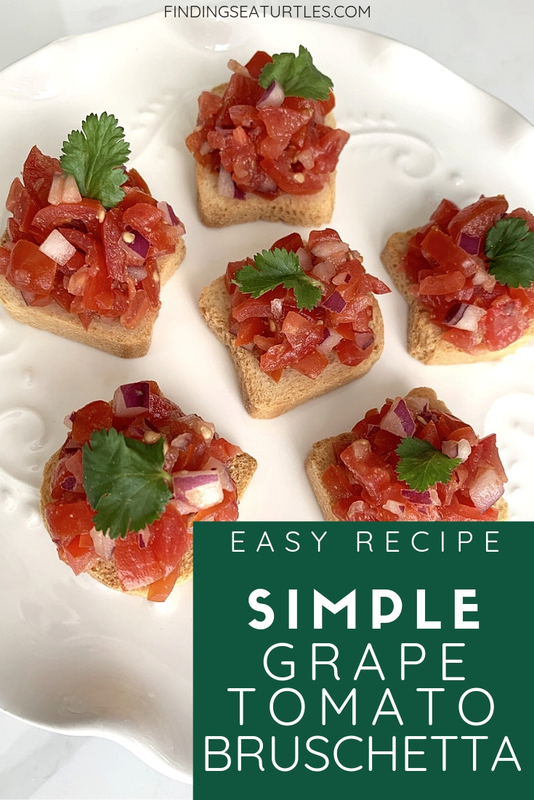 We love our quick and easy Grape Tomato Bruschetta recipe. A favorite family recipe year round. 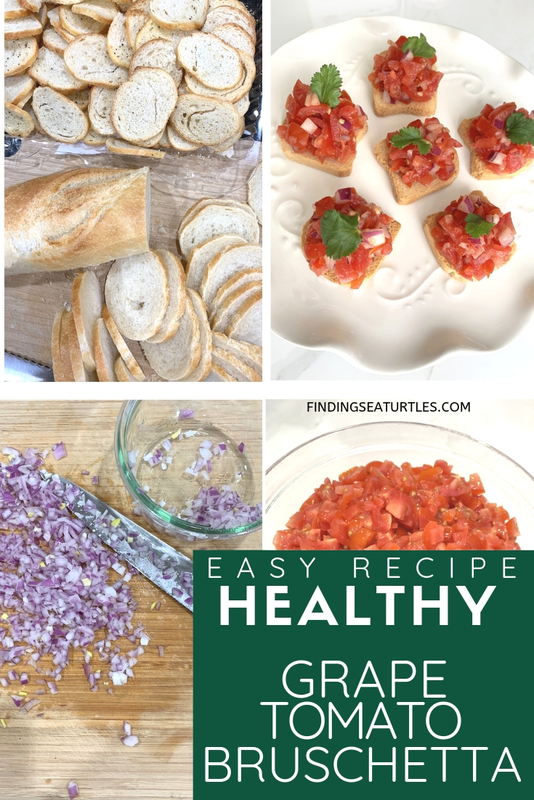 Our Grape Tomato Bruschetta recipe is simple and a healthy snack alternative. 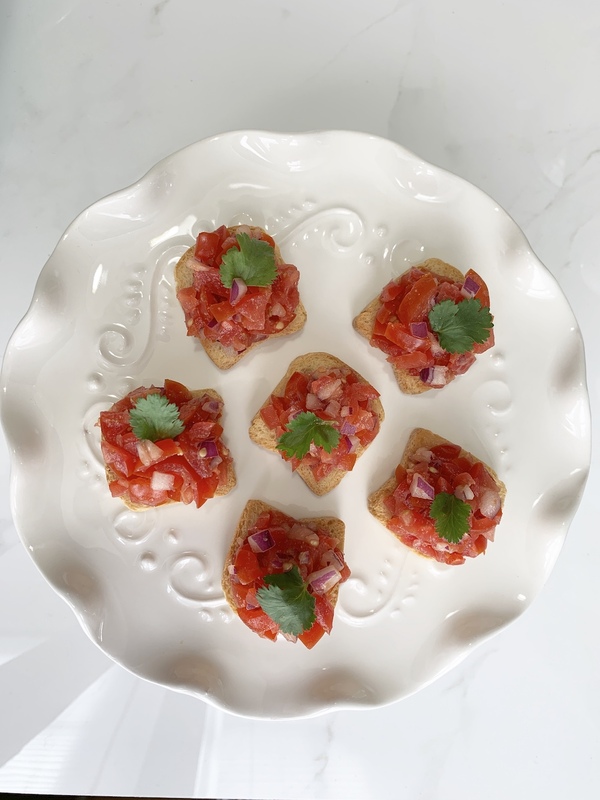 We’re certain you’ll like this bruschetta recipe, too. 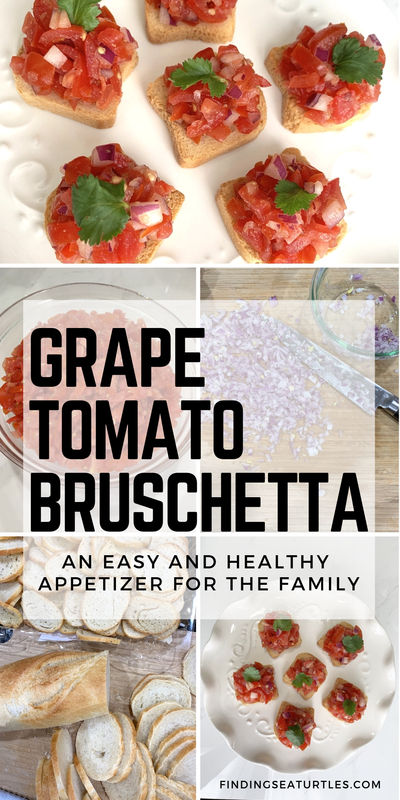 Your family will love this Grape Tomato Bruschetta recipe as much as ours does. Take a look and let us know what you think. 2 tablespoons of extra virgin Olive Oil . Gather the grape tomato bruschetta ingredients. Grape tomatoes, red onion, ground cumin spice, salt, and pepper. Have the olive oil and either the Baguette or Crostini nearby. Rinse and dry the grape tomatoes. Dice the grape tomatoes. 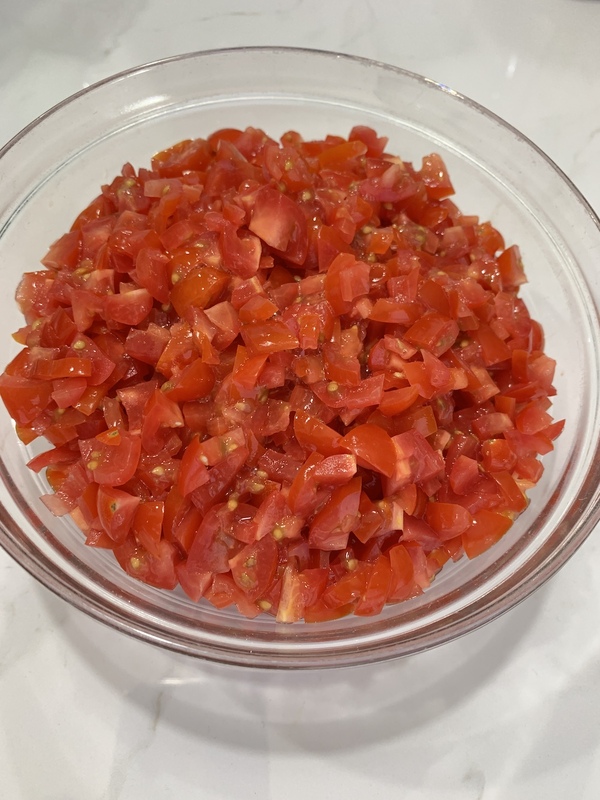 Add the diced grape tomatoes to a medium or large mixing bowl. Remove the outer skin of the red onion. Slice about ¼ of the red onion. Then finely dice the red onion. Set aside the diced red onion in a separate bowl. However, if you love onions, add more onions to the bruschetta. 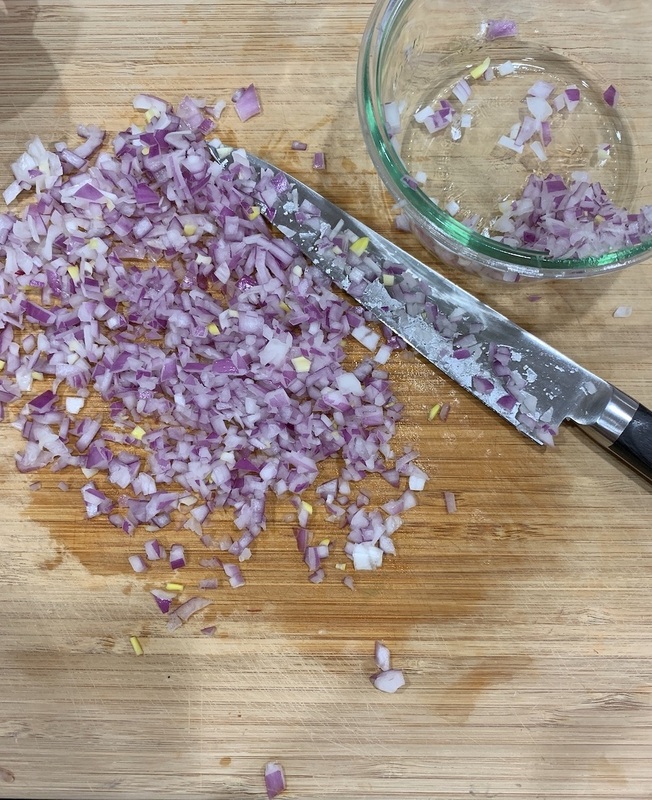 Or substitute the red onion for another variety of onion. Add the finely diced red onion to the diced grape tomatoes. Stir the red onion and grape tomatoes.Add 2 tablespoons of extra virgin olive oil. 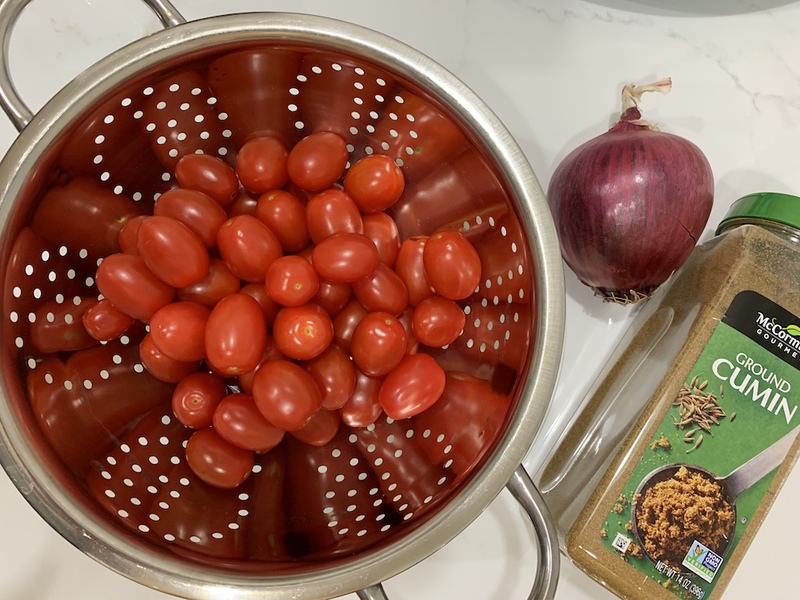 Add 3 teaspoons of ground cumin to the tomato onion mix. Add ground Sea Salt and freshly ground pepper next. Mix the seasonings with the tomato onion mixture. Stir the olive oil and seasonings with the tomatoes well. If you are using a fresh Baguette, slice the baguette into ¼ inch slices. Line a baking sheet with parchment paper. Placed the baguette slices on a baking sheet. Heat the baguette slices in the oven. Heat oven at 350 degrees. Bake baguette for about 5 minutes or so. Remove the toasted baguette slices from the baking sheet. Add about a spoonful of the grape tomato mixture on each baguette slice. Optional: add a fresh sheet of parchment paper to a baking sheet. Place the grape tomato filled baguette slices on the baking sheet. Reheat the baguette slices in the oven. Heat at about 350 degrees. Bake for about 2 to 3 minutes. Remove from the oven. 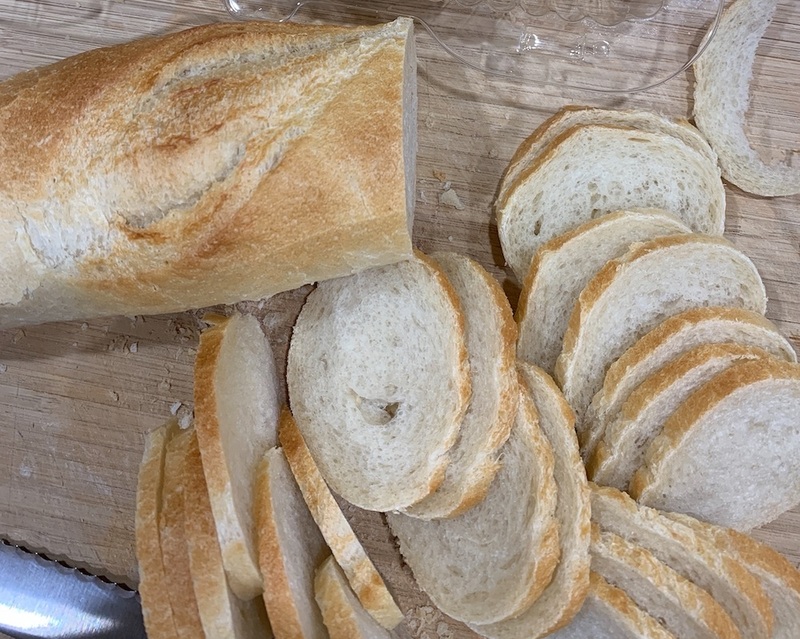 Place warm baguette slices on a serving dish or platter. 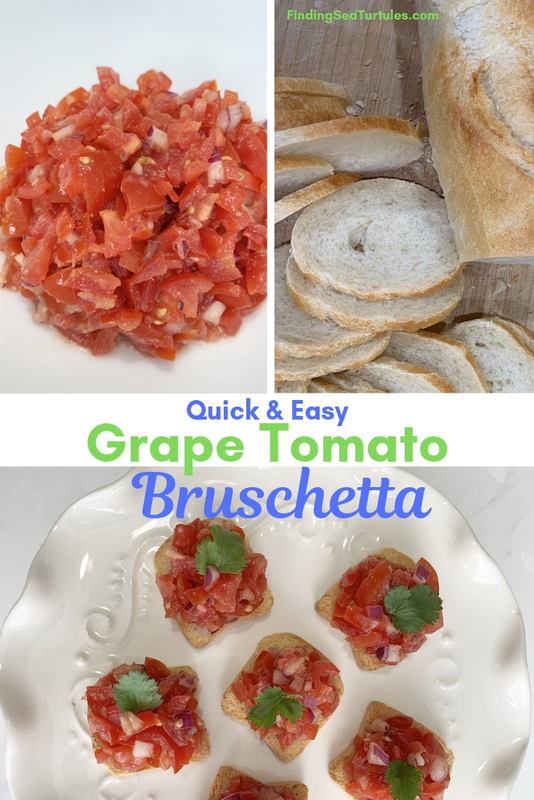 Serve the warm Grape Tomato Bruschetta. Note: in the Summertime, we typically don’t warm the grape tomato filled baguette slices. We serve them. We are more likely to heat the grape tomato filled baguette slices in the Winter. It’s entirely up to you whether to warm the bruschetta or not. Using a fresh baguette is nice. But baguettes are best serve the same day they are baked. The baguettes become stale the next day. As an alternative to a baguette, use Crostini. Crostini is a seasoned toasted sliced baguette. Available at local grocery stores or bakeries. What I like about Crostini is that they have a longer shelf life than a fresh baguette. But Crostini can be a bit pricey. Other budget friendly alternatives are to use mini toast or Water crackers instead of a fresh baguette. If you have the time, you can make your own Crostini using a fresh baguette. The instructions for making Crostini are below. Save money by making your own Crostini. It is actually very easy. And takes only a few minutes to make. The ingredients are listed below. And the recipe is follows. Heat oven to 350 degrees. Add parchment paper to a baking sheet. Slice a fresh baguette into ¼ inch slices. Brush with olive oil on the front and back of the baguette slices. Add sea salt and freshly ground black pepper to the slices. Place the seasoned baguette slices on the lined baking sheet. Bake in the oven about 15 to 20 minutes. The bake baguette slices are now Crostini. Store the Crostini in a tightly covered container for up to one week. As an alternative, you can add basil, oregano, or other herbs to the baguette slices before cooking. You may even want to experiment with different seasonings for more flavorful Crostini. Lavender and Truffle seasoning is always a good combination. This is the finished Grape Tomato Bruschetta. Not only tasty but healthy too. 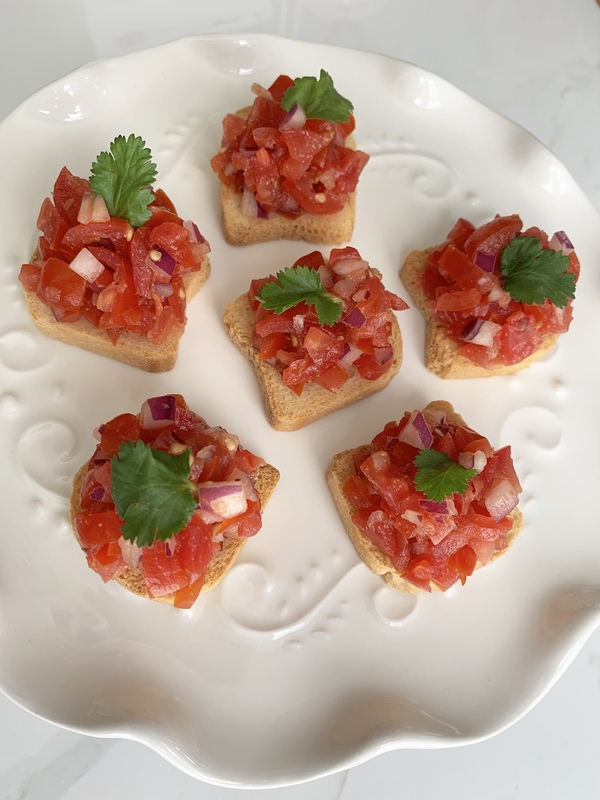 We hope you enjoy this delicious bruschetta! Interested in recipes? If you found this helpful . . .
You May Also Enjoy . . . . Some of our other recipes. 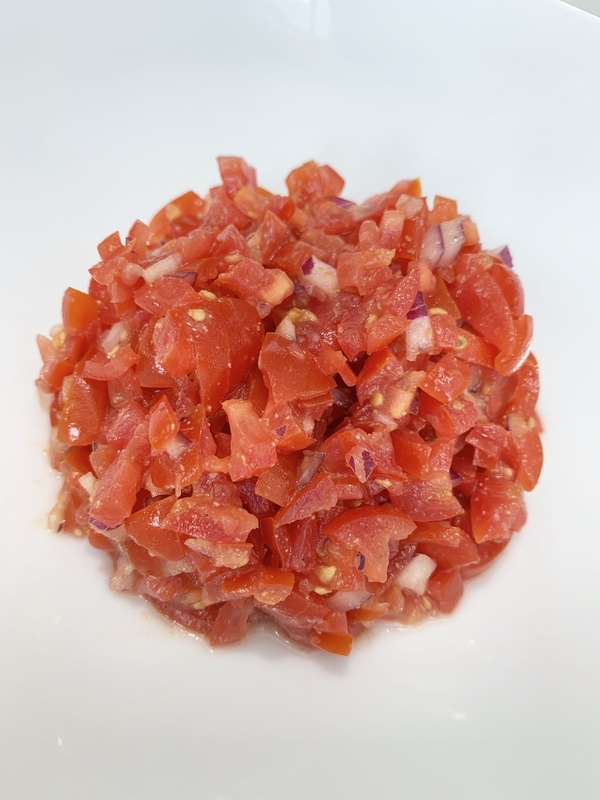 If you have a Grape Tomato Bruschetta recipe that you like, please consider sharing it with us. 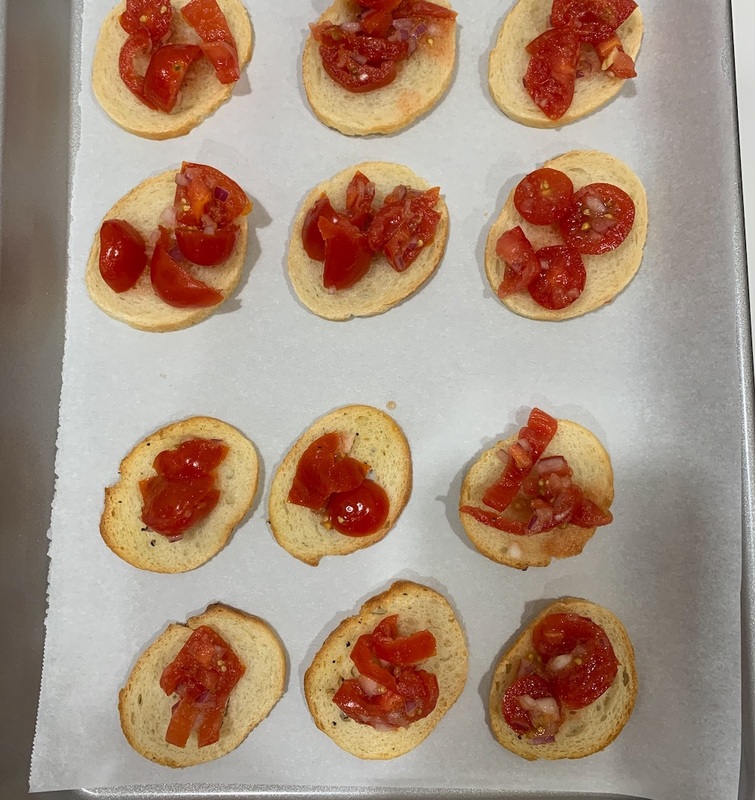 And if you try this Grape Tomato Bruschetta recipe, let us know how you make out in the comments below! If you have any questions, feel free to reach out to us. We always are ready to help you out. Thank you for stopping by.